Adept at walking and running due to partial webbing of feet. Slow wing beat during flight. Rarely swims. Most active early morning and late afternoon. Move between roost and feeding sites. Large flocks (thousands of individuals) comprised of many small breeding groups (1 male, 2-3 females, and offspring). Adults in breeding groups form long-lasting bonds. Seeds, blades of grasses, corms of the tall sedge water chestnut (Eleocharis dulcis). Goslings feed on seeds and invertebrates. © 2018 San Diego Zoo Global. How to cite: Magpie Goose (Anseranas semipalmata) Fact Sheet. c2018. San Diego (CA): San Diego Zoo Global; [accessed YYYY Mmm dd]. http://ielc.libguides.com/sdzg/factsheets/magpie-goose. We are grateful to Dr. Peter Bayliss for providing exceptional expert content review of this fact sheet. Dr. Bayliss has been conducting research on the Magpie Goose and other coastal animals in Australia for over 40 years. He has extensively studied Magpie Geese in tropical northern Australia, conducting studies of abundance and distribution, breeding ecology, and the impacts of sea level rise and harvest practices. Dr. Bayliss’ work as a natural resources manager focuses on marine, coastal, and freshwater ecosystems. He holds diverse experience and expertise in wildlife ecology, wetlands monitoring, aerial surveys and ecological modeling, fisheries, climate change analysis, and community participation (particularly Aboriginal communities) in natural resource management. Dr. Bayliss is Principal Research Scientist at CSIRO, Australia’s premier national science institute. 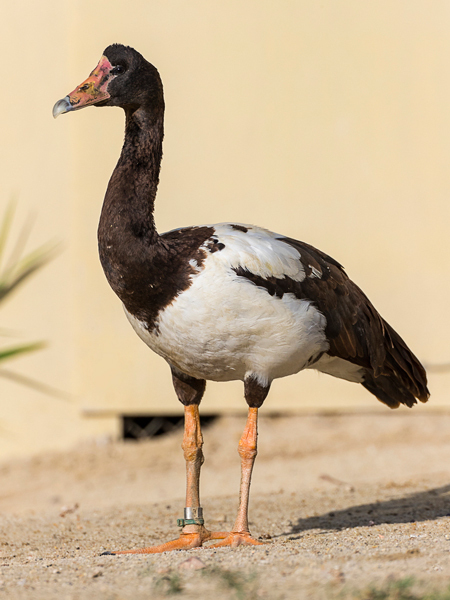 Many thanks to Suzy Carey, Senior Bird Keeper at the San Diego Zoo Safari Park, for sharing her knowledge of Magpie Goose husbandry for the Managed Care section of this fact sheet. Thank you to Dr. Zhonglou Sun of Anhui University, China, for providing clarification and additional references on the evolution of Anseriformes.